The Dogwood tree used to grow large and tall. It was comparable in size and shape to that of an oak tree. 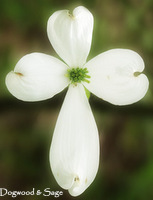 At the time of the Crucifixion, it was said that wood from the Dogwood tree was selected to fashion the cross. This distressed and saddened the Dogwood tree so much that Jesus took pity on the tree, promising that Dogwood trees would never again grow large or straight enough to be used for the making of crosses. It would be twisted and bent. The four petals of the flowers would form the shape of a cross, at each petal edge a rusty nail mark would be cut, the bracts in the center would now resemble a crown of thorns, and it would bear blood-red berries; in his memory. and the red dogwood, called the Cherokee, bears its red color to remind us of the bloodshed. The Dogwood is the state tree and the state flower of Virginia, where I grew up.